For many tenants of a three-building apartment complex on Burlington Avenue in Westlake, the rent hikes announced earlier this year were a clear message from the landlord: pay up, or make room for someone else who can. But residents of roughly half of the complex's 180 units say that message isn't palatable. It's why they've launched what organizers say is one of the largest rent strikes in Los Angeles's history. As rents in Los Angeles continue to rise, the city is seeing a resurgence of this century-old advocacy tactic, which involves tenants withholding their rent checks to pressure their landlords into negotiating rents and often into improving building maintenance. "People have to band together," said Trinidad Ruiz, an organizer with the Vermont Beverly local chapter of the Los Angeles Tenants Union (LATU), a volunteer organization that teaches renters their rights and how to use them. "A rent strike with one person isn't going to change anything. You need an entire complex to do the rent strike." Organizers say the recent uptick in SoCal began with a 2016 strike in Highland Park. In that case, tenants living in the 60-unit, non-rent-controlled Marmion Royal building, across the street from the local Gold Line station, began withholding rent after the building was sold to a corporate owner that hiked the rent and started renovations while people continued living in the building. Since then, desperate tenants in several buildings around the city have turned to the strategy, usually through the assistance of the (LATU) and a patchwork network of eviction defense legal clinics. In Boyle Heights, the Mariachi Tenants reached an agreement with their landlord in February after a months-long standoff following a rent hike. In Exposition Park, tenants in six buildings close to USC went on strike after a new owner served them with notices to vacate. In Long Beach, tenants in at least six different buildings have gone on strike this year, according to the Press Telegram. And other actions in smaller buildings are playing out beyond the headlines. "They are in a no-win situation. When you're in a no-win situation, you fight," said Ruiz. "They aren't able to pay the rent, so they'll end up on the street. If they lose the rent strike, they'll end up on the street. Only if they win the rent strike, then there's a chance they'll stay." RISING RENTS BUT LITTLE MAINTENANCE? 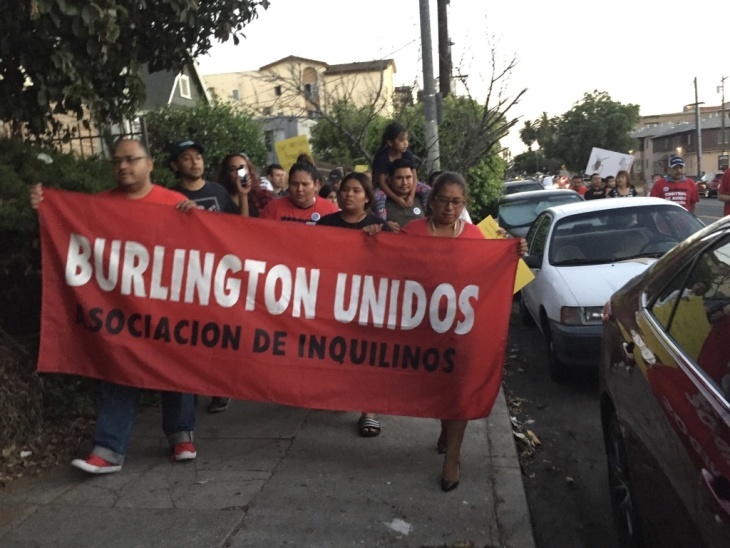 The strategy tenants in the Burlington complex are using is similar to that being deployed by others around SoCal and the country: they're withholding rent to force the landlord to take each of the striking tenants to eviction court individually, where they'll argue their case. It's a costly and intensive process, and tenants hope their landlord will give up and abandon the proposed rent increase, or at least be compelled to fix the building. But it's risky for the tenants; if they lose their case, they get evicted. Like those in most of the other strikes in the Los Angeles area, the residents are mostly low-income, Spanish-speaking immigrants from Mexico and Central America who struggle to make ends meet. Joana Ochoa's family, which includes her husband and their three daughters, is one of dozens in the Burlington buildings who have stopped paying rent after their rate went up multiple times between January and April. The total increase for them was about $350. Other tenants said they received similar rent hikes. Ochoa said that picking up and moving to a new apartment is out of the question, a sentiment shared by other striking residents. In addition to the steep cost of moving, it's virtually impossible to find an apartment anywhere nearby at a rate comparable to what they've paid in previous years. "If I move from here, I can't afford to pay $2,000 or $3,000 a month in rent," said Ochoa. "It's too much, I just can't do that, and I can't find anything here close to what I paid." Ochoa wouldn't say what her exact rent was, but the building's owner said rents were raised to match the federal Department of Housing and Urban Development's fair market rate for Los Angeles, which the agency uses to determine some kinds of subsidies and rents in public housing units. HUD rates place monthly rent for a one-bedroom unit at about $1,300, and rent for a two-bedroom at about $1,600. Another tenant said they had been paying $900 for a one-bedroom unit before the increase. Citywide, the median rate for a one-bedroom unit is about $2,200 per month, according to Rent Cafe, so even with the rent increase, the landlord argues, the Burlington buildings remain among the most affordable in the city. But that doesn't mean the tenants currently living there can afford to pay it. In Los Angeles and Orange counties, about a quarter of all households spend more than half their income on rent or are crowded into "severely inadequate housing," according to a report by the U.S. Department of Housing and Urban Development (HUD) based on 2015 numbers. Though Los Angeles is one of the 15 California cities that has rent control, all of the Burlington buildings were built in the late 1980s, more than a decade after the 1978 cutoff date for the city of L.A.'s Rent Stabilization Ordinance. Rent increases in buildings built before 1978 are limited to about 3 percent each year. No such provision exists for buildings built after. One added wrinkle that may help the Burlington residents in court is the shabby condition of the apartments. The legal justification for their rent strike comes from a provision of California state law that says renters are allowed to withhold their monthly rent checks if a landlord fails to maintain a property to habitable standards — addressing things like mold, vermin infestations and other poor conditions. "The rent increase is legal, but [the landlord] also has to maintain the apartments," said lawyer Elena Popp, who heads the nonprofit Eviction Defense Network. "The lack of maintenance gave the tenants the opening to do a rent strike." Walk through one of the Burlington buildings and the signs of dilapidation are clearly evident. Sewage residue from past backups is visible on the floors and walls in the building's parking garage. Paint peels away from moldy surfaces. Many walls are soft to the touch, hinting at leaky pipes behind. According to Popp, the rent hikes earlier this year prompted residents to question why the cost was increasing, but the building's condition wasn't improving. "It was too much for a lot of people, particularly in light of all the bad conditions," said Popp, the lawyer. "For the first time, people started questioning, 'Why do we have hot water shut-offs so often? Why do we have to live with roaches? Why do we have to live with a pigeon infestation?'" A representative for the building's owners, Lisa Ehrlich and Donald Crasnick, said that "all tenant complaints about maintenance issues are always immediately addressed." They also said that the owner hadn't raised rents in several years and that the recent increase is intended to cover rising maintenance costs. "STORIES THAT ARE OLD, YET NOT OLD"
In Southern California, as elsewhere in the country, the rent strike tactic has come and gone through the years. In the late '80s and early '90s, the Los Angeles Times covered several "bitter disputes" between landlords and tenants around the region. One in Anaheim that involved 67 tenants who lived in what their attorney called a "pit of squalor" dragged into a seven-year lawsuit. It concluded in 1992 when a Santa Ana judge ordered the landlord to pay $266,000 to the tenants. That strike stemmed from a larger action in 1985 involving almost 500 tenants in three Orange County cities, the Times reported at the time. The high-water mark for rent strikes in the San Fernando Valley was 1978, when the Times covered eight tenant strikes in Van Nuys, North Hollywood and Encino. Most were settled, and some revolved around landlords who failed to reduce rents as promised if voters approved Proposition 13, which cut property taxes overnight. Decades earlier, in the 1920s, rent strikes were semi-regular occurrences on Bunker Hill. By then, the once-stately neighborhood was popularly considered to be declining as its mansions were subdivided into tenement housing for L.A.'s newcomers. It's a similar story in other parts of the country. Roberta Gold, a historian who wrote a book on tenant activism in New York City, said most strikes stem from familiar factors like a shortage of affordable housing and overcrowded conditions. "Stories that are old, yet not old. Still very familiar," she added. Gold thinks the earliest rent strikes in the United States probably occurred in crowded downtown Manhattan tenements in the early 1900s. She said the tenant strikes were modeled after other forms of collective action in the labor arena and the consumer arena. "People were familiar with labor unions and labor strikes seeking to exert leverage for workers at the point of production," said Gold. "They imported the language of labor organizing into tenant organizing, calling their groups 'tenant unions' and non-participating neighbors 'scabs.'" She added that strikes basically became routine in New York until the Great Depression turned the city's housing market on its head, giving tenants the upper hand. "RENT IS RISING EVERYWHERE ELSE"
Of course, the background for the Burlington strike today isn't the the progressive backlash to America's Gilded Age; it's Westlake's changing dynamics and the area's emerging gentrification. New development is spilling into the neighborhood from adjacent Downtown L.A. and Koreatown, and the neighborhood's northern portion — where the Burlington buildings are — is just a few minutes' drive from the cafes and vintage shops of Sunset Boulevard. The striking tenants also live within the boundaries of the controversial proposed North Westlake Design District. "We're very close to Echo Park, and people are buying apartments and remodeling them because we're so close. I think the landlord said to herself 'Well, rent is rising everywhere else, so why not me?'" said Ray Estrada, who lives in one of the buildings. But before rent goes up, Estrada said he believes the building needs to be maintained to some basic standards. "We're not complaining to say that we want free rent," he said. "No, we want to pay our rent, but we want to live in a safe environment." For now, the Burlington tenants remain in court. The sheer number of individual Burlington cases mean it could take more than a year for the L.A. County eviction court system to process all of them. But in other buildings, the ongoing stress of sustaining a strike, and the accompanying legal process, means tenants often end up leaving anyway. Organizers and tenants who participated in the Marmion Royal strike in Highland Park say most of the tenants involved have since left the neighborhood. Apartments in that building are now marketed as "creative flats."